Chemistry and physics of materials and structures in the nanometer range. Nanostructures are smallest arrangements whose magnitude between microscopic and molecular structures is - ie approximately in the size range of less than 100 nanometers (100 nm). Scientific areas that deal with nanomaterials and nanostructures include nanotechnology, materials science, physics and chemistry. Nanochemistry deals with the synthesis and chemical characterization of nanomaterials. 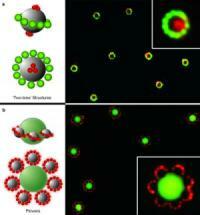 The nanotoxicology rated health and environmental aspects of nanoparticles. The following list contains information on individual nanostructures and research reports, institutions and other sources. A new imaging technique developed by researchers at the University of Illinois overcomes the limit of diffraction and can reveal the atomic structure of a single nanocrystal with a resolution of less than one angstrom (less than one hundred-millionth of a centimeter). What do Saturn and flowers have in common? By manipulating the magnetization of a liquid solution, the researchers have for the first time coaxed magnetic and non-magnetic materials to form intricate nano-structures [Image credit: Duke University]. Nanomaterials are a fast developing field of research and applications lie in many separate domains, such as in hi-tech (optics, electronics, biology, aeronautics), but also in consumer industries (automotive, concrete, surface treatments (including paints), cosmetics, etc. ).